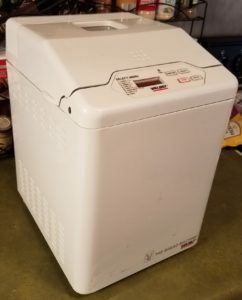 One of my favorite garage sale finds: my bread machine! I recently discovered the joys of using a bread machine. I love bread! There is no meal that is not made better by a hot fresh slice of bread or a roll straight from the oven. I bought a used bread machine a few years ago from a garage sale. I rarely used it and considered getting rid of it because it seemed like a waste of space in my kitchen. I’m so glad I didn’t! 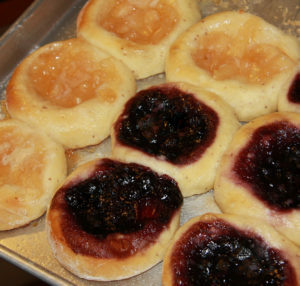 I wanted to try making a pastry my grandmother always made for us when I was growing up called kolaches. There are many varieties of kolaches, but the kind I remember her making the most was a sweet variety with a prune filling. I don’t have much experience with making bread dough, plus I was on a little bit of a time crunch. I thought I’d try seeing if my bread machine could make the dough for me. I was so happy to discover it could. I found a similar dough recipe and gave making kolaches try. They were amazing. I’ve also tried making raisin bread and simple white bread, both turned out really well. Bread made in the oven is pretty amazing, too. A friend gave me a loaf of beer bread that was just amazing. It was dense, but still fluffy, and it went perfectly with soup. I could not request the recipe fast enough. It is a favorite in my house. It also helped to discover that beer bread is really easy to make. Since I’ve discovered how much I love homemade bread and pastries, I’ve been trying different recipes. I was so happy to discover bread cookbooks with recipes for many different varieties of breads that work in my bread machine or the oven. The one I’m the most excited to try is The Bread Lover’s Bread Machine Cookbook by Beth Hensperger, which has 300 recipes for different kinds of bread. Browse our cooking neighborhood either in person or online to find some new recipes. What are some of your favorite bread recipes or bread cookbooks? Abigail is the Community Services Librarian. She loves to read, write, listen to music, crochet, watch DIY television, and eat pretty much anything that involves potatoes or chocolate. Some recent reads that she loved were "The Invisible Library" by Genevieve Cogman and "The Rose and the Dagger" by Renee Ahdieh. Posted in Around the Home and tagged Bread, Bread Machine, cookbook, cookbooks, Cooking, Cooking Neighborhood.